What did I tell him? "If people don't make good use of the CPF to help plan for retirement, well, they won't get much out of it. 😉"
If AK says so, it must be so. Any advice or comments on the forum article above? I don't bother calling CPFB for things like that because I use the CPF LIFE Payout Estimator online. Notice that the payout estimated falls in a range. It is just an estimate. I would like to ask you about transferring from OA to SA. Currently my mother is under CPF life. 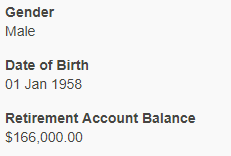 According to CPF board, I am able to withdraw the OA and SA. Is there anything I should look at before transferring OA to SA? Thanks! OA to SA transfer is not allowed for those 55 years and older. the RA amount that is not deducted for CPF life, what can we do with that balance? RA is meant to fund our retirement. Cannot be withdrawn unless the member passes on. That is if there is anything left. but how does it fund our retirement? All the RA money will be depleted by age 85 (under the LIFE Standard Plan). may I ask how will it be depleted? It is used to fund the payouts. 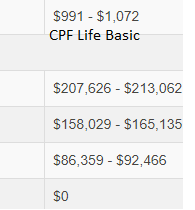 Even after all the funds have been depleted at 85, CPF LIFE continues to pay until the day we die. 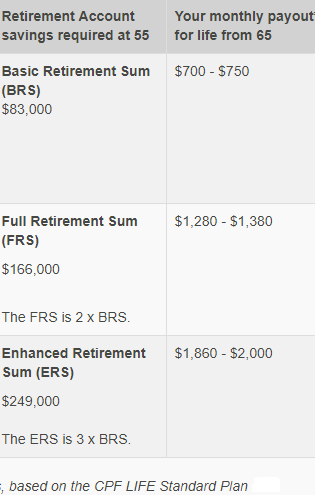 So, A and B will have FRS $166K in RA. 1. Changes to the CPF. 2. Worry about retirement adequacy the right way. What happens if I choose the CPF LIFE Standard Plan? When you join CPF LIFE Standard Plan, we will deduct the entire savings in your Retirement Account as the annuity premium at the point of policy issuance. The premiums deducted will be paid into the Lifelong Income Fund. You will receive monthly payouts from the Lifelong Income Fund after your policy is issued for as long as you live. What happens if I choose the CPF LIFE Basic Plan? When you join CPF LIFE Basic Plan, w​e will deduct about 10% of your Retirement Account savings for the annuity premium at the point of policy issuance. The actual percentage will depend on your age and gender. We will inform you on the amount deducted when your policy is issued. The premium deducted will be paid into the Lifelong Income Fund. The rest of your Retirement Account savings will stay in your Retirement Account. You will receive monthly payouts from the savings in your Retirement Account after your policy is issued until one month before you reach 90 years old. Once you reach 90 years old, you will continue to receive monthly payouts from the Lifelong Income Fund for as long as you live. Will my Retirement Account savings continue to earn interest? Yes, the remaining savings in your Retirement Account will continue to earn an interest of 4% per year. In addition, the first $60,000 of your combined CPF balances, of which up to $20,000 from your Ordinary Account, will earn an extra 1% interest per year. Combined balances refer to the total balances in your Ordinary, Special, Medisave and Retirement Accounts, including the annuity premiums for CPF LIFE less any payouts made. From January 2016, an additional extra interest of 1% per year will be given on the first $30,000 of your combined CPF balances (for members aged 55 and above). This is on top of the existing 1% extra interest on the first $60,000 of combined balances. Will my savings used for CPF LIFE premium continue to earn interest? Yes, your savings used to join CPF LIFE i.e. the annuity premium will continue to earn interest. The interest earned on the annuity premium will be paid to the Lifelong Income Fund and pooled together with the interest of all CPF LIFE participants. The interest will be paid to you as your monthly payouts for as long as you live. Where will the extra interest be paid to after I join CPF LIFE? If you have chosen the CPF LIFE Standard Plan, the extra interest will be paid into the Lifelong Income Fund. By paying the extra interest into the Lifelong Income Fund, you will be able to enjoy a more stable payout for the rest of your life. We will pay the extra interest to you as part of your monthly CPF LIFE payouts. If you have chosen the CPF LIFE Basic Plan, we will pay the extra interest earned into your Retirement Account and pay it to you in the year it is earned as part of your monthly CPF LIFE payout. When your combined balances fall below $60,000, the extra interest will reduce. This reduces your monthly CPF LIFE payouts gradually. Every time I see the phrase "CPF Life", I'm reminded that they abolished the CPF Life Income Plan citing "low take-up". And I continue to feel very miffed about it. Income Plan option was the highest payout but zero bequest --- was that the one where if a person dies 1 day after having emptied his RA into CPF Life on his 55th birthday --- his next-of-kin/nominees would not get back the premiums paid, even though totally unused?? I think this US-style. And after GE2011, I guess they didn't want to take any chance of people "accidentally" choosing the Income Plan, and then having family members creating big hoo-ha when CPF says "Sorry, no more money left to refund". Will have even more "Con People Fund" stories floating around! Hahaha!!! if you have to choose, which cpf life will u take up? basic or standard? and why? Quite a few people have said this. Maybe, someone should write to the CPF Board with the suggestion. LOL. I won't say what I would do but logically, to me, if we do not have dependents, we should choose the Standard Life Plan. If we have dependents, then, the Basic Life Plan. The decision hinges upon how much we want to leave behind if we should go a bit earlier. I'm thinking if CPF hires AK as their "trumpeter", they will keep AK hidden away from the limelight when things go well and rosy. Instead, their Chairman and CEO will bask themselves in the glory. But when situations get ugly, they'll push him to the angry mob to be devoured. Hi AK, why is the scaling on the payout different from the scaling on the retirement sums? The 2018 BRS min payout is $720 but FRS min payout is $1320. Shouldn’t it be at least $1440 for FRS? I was expecting that with a larger amount committed, the payout should be higher. I foresee that the withdrawal age will be raised to the age of higher than 70. I won't be surprised if the age is higher than 100 in the foreseeable future. So it will be more sensible to rely solely on own saving for retirement. Actually, the compulsory withdrawal age for CPF Life is 70 years of age now. Members have the option of requesting for payouts to start at 65 years of age. For sure, treating our CPF savings as only a cornerstone in retirement funding is being realistic. Hi AK shifu, I would like to consult you regarding CPF. My mother and dad are 70 and 75 years old. They each have about 10k each in their cpf. I am thinking of topping up their cpf to the full retirement sum each. Around $250k each for them to get monthly money from the CPF. They will nominate me their Cpf. Would like to ask you if this is possible idea. You should check with CPFB because they are 70 years or older. CPF starts paying members a monthly income once they hit 70. If they are not on CPF Life, they will be paid until their RA is depleted. 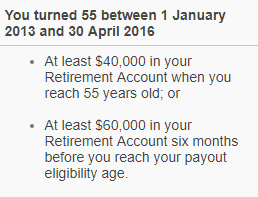 To participate in CPF Life, I think they must have had at least $60K in their RA at 65yo (the earliest age allowed to start monthly pay out). Ok, from what I read I think they are both no longer able to participate in CPF life due to their age and they have less than 60k in their RA at 65yo. Is there any advantage in this case, in topping up my elderly parents cpf?